Since MLB's traditional Opening Day some two-plus weeks ago, five umpires have left games after being struck in the mask by a foul ball or errant pitch, causing the League to employ its concussion protocol for home plate umps at an exorbitant rate of twice weekly, on average. What is driving this trend and what can umpires do about it (other than refusing to work Brewers plate jobs, seeing as the past three game-ending head injuries over the past week have occurred during games featuring Milwaukee)? Are umpires really getting hurt more often in 2019? The short answer is "yes." Game-ending head injuries for the first 19 days of the 2019 regular season, as of April 15, sit at five (roughly once every four days). Related Post: Injury Scout - Kulpa Out as Brewers Cross Up Again (4/15/19). Related Post: Injury Scout - Brian Knight Leaves After Foul to Mask (4/12/19). Related Post: Injury Scout - Hallion Out in Anaheim After Hit to Head (4/9/19). Related Post: Injury Scout - Jerry Layne Exits After Two Head Hits (4/1/19). Related Post: Injury Scout - Scott Barry Hit by Fastball Late in LA (3/29/19). In 2018, after Mike Everitt was concussed on Opening Day (March 31), the next injury did not occur until three weeks later, when Jerry Layne left a game due to an arm injury on April 19. 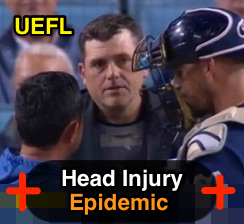 It took until May 15—one-and-a-half months following Everitt's season-ending head injury—for another umpire to suffer a game-ending head injury (Fieldin Culbreth, May 15). Related Post: Injury Scout - Fieldin Culbreth Departs on Foul to Jaw (5/15/18). Related Post: Injury Scout - Everitt Concussed on Pitch to Head (3/31/18). Why? When it comes to addressing possible reasons for this trend, we could cite positioning issues (see following section) or injury-prone histories, but it appears we've had a few unpreventable head traumas this young season. For instance, when Ron Kulpa was knocked by a pitch that eluded his catcher, the primary cause was simple: the catcher and pitcher weren't on the same page, and the umpire bore the brunt of it. One UEFL'er even posited that cross-ups could be a byproduct of teams' reluctance to utilize their limited mound visits. Positioning: Taking care to work the slot—roughly between the catcher and batter, as opposed to directly above the catcher, etc.—may lessen the likelihood of being struck, and thus injured, by a wild pitch or foul ball, but staying in the slot alone isn't a 100% guarantee that a plate umpire won't be hit by a ball. That said, it's always a good idea for a plate umpire to review plate work positioning guides such as the one pictured to the right. Green = good and red = bad. Addressing a Head Injury: If a head injury occurs, follow concussion protocol by acknowledging the injury and seeking on-field evaluation if possible. If you experience symptoms—including mental fogginess/being in a daze, confusion, headache, balance problems, amnesia, numbness, and/or loss of consciousness—exit the game immediately and seek medical attention. Your medical professional will be able to advise you on further issues, such as care, recovery, and when to return. For more information, see the following from Ump-Attire. Alternate Link: Part 1 of UA's plate umpire concussion series, with Scott Kennedy (U-A). Alternate Link: Part 2 of UA's plate umpire concussion series, with Scott & Jim Kirk (U-A). Alternate Link: Part 3 of UA's plate umpire concussion series, with Scott Kennedy (U-A).